✅ ALL-IN-ONE KIT with THE MOST COMPREHENSIVE STEP-BY-STEP GUIDE which will take you from the very start to finish and show you all little details you need to take care of to bake these finicky but irresistibly delicious cookies; Yes, you will have fun; You will be shocked at how easy they are to make! 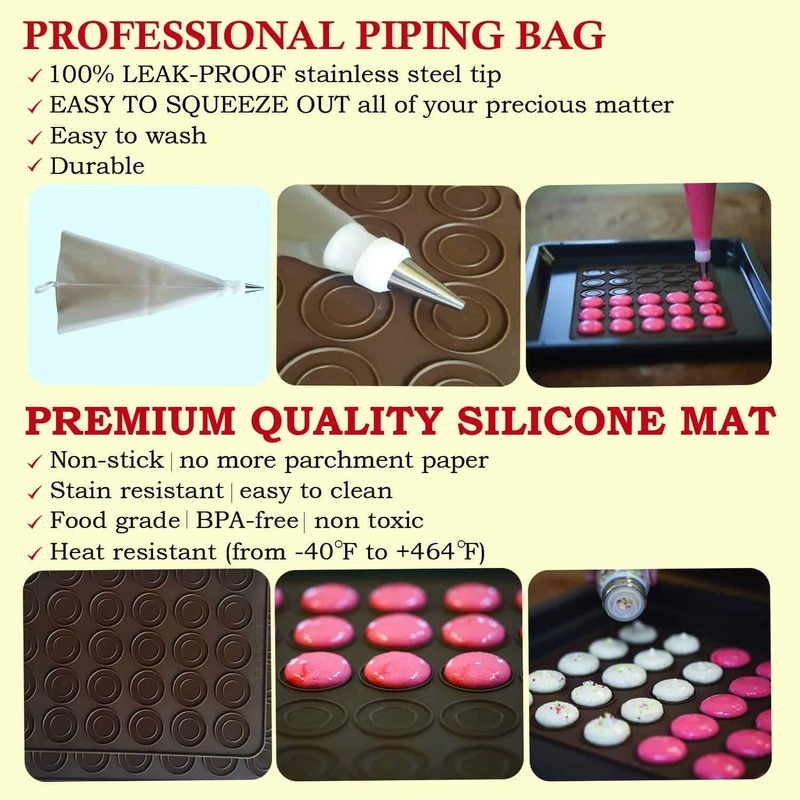 ✅ NO STICKING, PERFECTLY ROUND AND UNIFORMLY SHAPED MACAROONS – thanks to the silicone sheets, the macaroons will come perfect, just like baked by a professional, even if you are a beginner; NO NEED FOR GREASING OR SPRAYING – your cookies will be healthier without using toxic saturated fats. 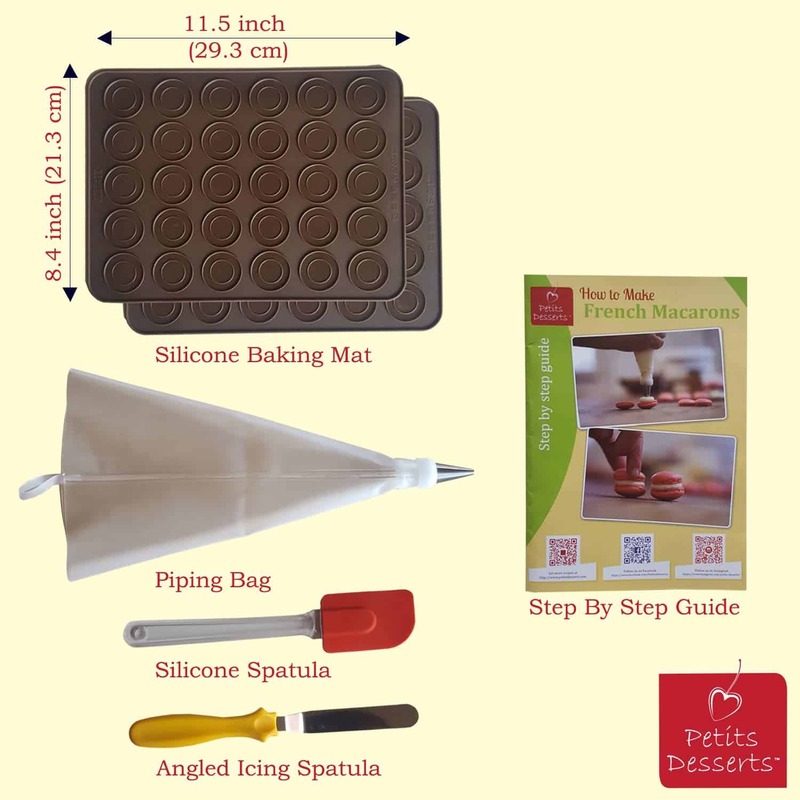 ✅ SO CONVENIENT – baking macarons with this set is mess-free (as it can be) and an easy job for you; while one mat is in the oven, you can use the second sheet to prepare a new batch; easy to clean up – use the dishwasher (top rack) or just wash the mats in hot soapy water; NO MORE WAXING AND PARCHMENT PAPER will save you money. 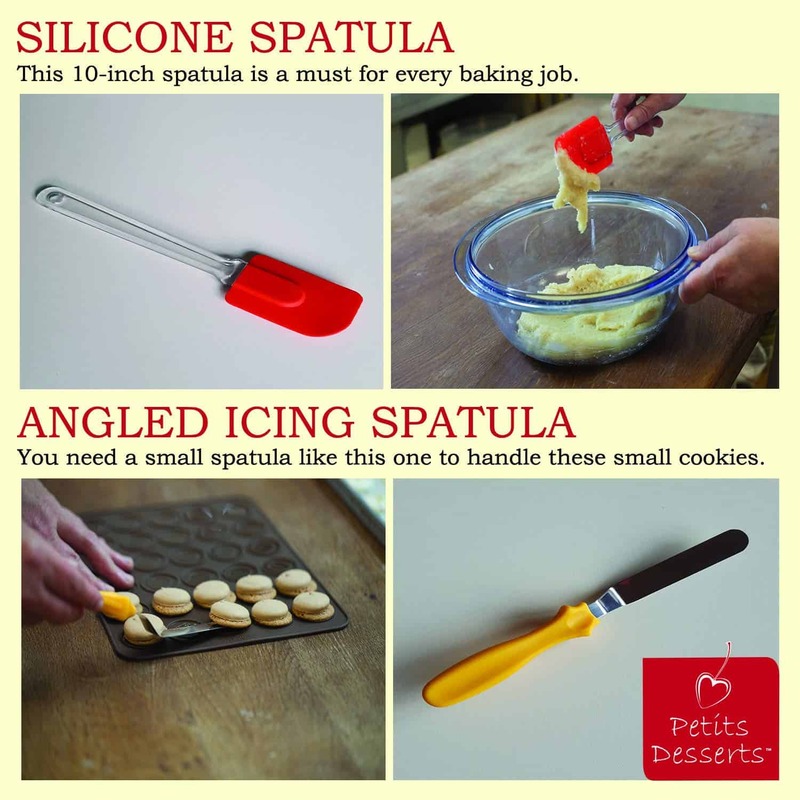 ✅ YOU GET ALL THE TOOLS YOU NEED and they are all HIGH-QUALITY ACCESSORIES – 2 macron baking mats, a piping bag, a silicone spatula, and an icing spatula; The professional-type PIPING BAG with a stainless steel tip is 100% LEAK-PROOF and you will easily squeeze out all of your precious batters – you will not waste any of it; All you have to buy is ingredients. 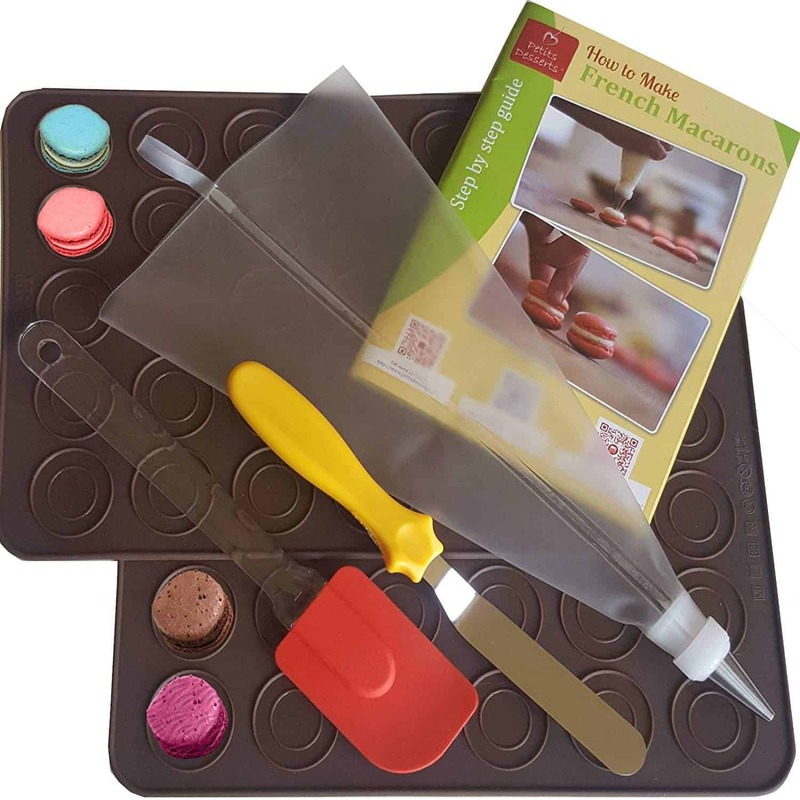 ✅ WE PROMISE YOU that baking your own macarons using this kit will be a lovely experience; This set is a fun way to get interested in baking; The product box is a nice presentation and the macaron baking set is A PERFECT GIFT. 100% CUSTOMER SATISFACTION GUARANTEE – our product is covered by a manufacturer 30-day money back guarantee and a 1-year product warranty. 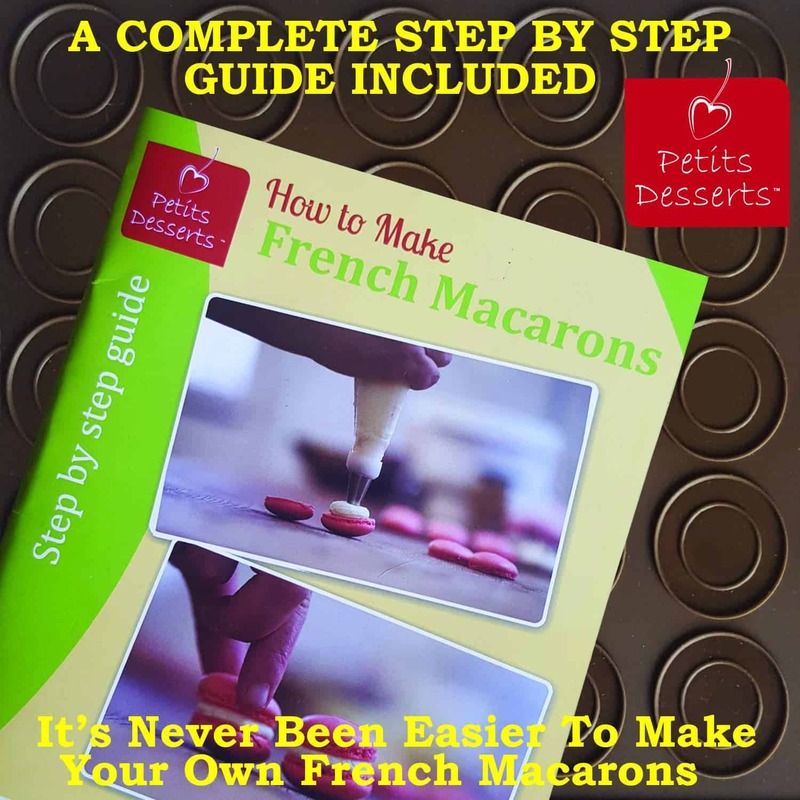 You will manage to make store-perfect macarons easily, and it will be a “pain-free” experience. With this set, your lovely cookies will consistently turn out awesome in their shape, color, and texture, plus quite a bit tastier. This baking set can also make you save a lot of time. You can make these delicious desserts for fun. Once you make them right, it’s difficult not to get passionate about them. Or make them on a formal occasion and you will impress your guests. With a colorful presentation, it is a proven way for you to make your guests go “Wow!”. Get ready for a shower of compliments! We promise you that you will get awesome results with this amazing baking set. If you are not completely satisfied, ask for a full refund. However, you should understand some things about these masterpiece cookies. Despite their simple ingredients, they are just so finicky to temperature, humidity, timing, and many more. So, don’t be deceived by the initial learning curve. You have to find your own way, but it will be worth it in the end.